Will Bennington had to give up more than half his flock of chickens last spring when a Burlington code enforcement inspector busted him for having too many hens in his yard. The bushy-bearded University of Vermont undergraduate had 10 layer hens outside his apartment on Decatur Street in the Old North End — six more than city ordinance allows. So he and his housemates sent their feathered friends away to a farm and made do with fewer omelettes. Now Bennington is trying to convince the powers-that-be to increase the number of chickens backyard farmers can raise. Zoning ordinance permits no more than four chickens per property — whether it’s a single-family home or multiunit apartment building. Bennington and others argue that’s unfair to renters who share backyards with other families and therefore get fewer eggs each. Today, Bennington keeps four chickens in a homemade coop. They peck at food scraps on a dirt patch outside. Together, the birds lay two to three eggs a day, fewer in winter. It’s sufficient for his household, Bennington says, but not enough to share with his friends and neighbors, as he used to do when he had 10 birds. Urban farming was already trendy before this summer’s salmonella-tainted- egg scare gave consumers another reason to go local. Burlington’s livestock regulations have been a hot topic on the Old North End’s Front Porch Forum; the majority of contributors appear to believe the four-chicken limit is unreasonable. Burlington’s chicken farmers can procure locally raised eggs at City Market or any one of the city’s seasonal farmers markets. 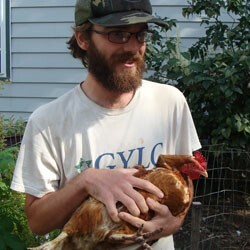 But for Bennington and others like him, raising hens is the ultimate localvore experience. Plus, he says the flavor of fresh eggs, with their deep orange yolks and silky texture, is far superior to anything he can get at a grocery store. Burlington code enforcement director Bill Ward says there’s “room for discussion” on chicken limits but suggests it will be on a case-by-case basis. Some multiunit apartments could accommodate four birds per unit, he says, while others clearly could not. An example of the latter, he says, is Decker Towers, the 159-unit apartment building at 230 St. Paul Street. If every tenant in the building wanted four hens, there would be more than 600 birds crammed onto the property — an outlandish scenario, but conceivable on paper. “I would think the neighbors on Church Street behind there would be pretty upset that the Perdue family was keeping a farm behind there,” Ward says. To date, Ward’s office has received few, if any, complaints about noise or smell from backyard chickens, he says. Bennington’s overcapacity chicken coop was discovered this past June because a code inspector was on Decatur Street for an unrelated call. But Ward predicts that more chickens could mean more complaints. City Councilor Bram Kranichfeld (D-2) represents the Old North End and says several constituents have spoken to him about the issue. Kranichfeld supports raising the limit from four chickens to something higher, but says he’ll leave it to the experts to find an appropriate number. The Board of Health, which can advise the city council but can’t change city ordinance, wants to put chickens on its October meeting agenda, chairman Ian Galbraith says. The board’s sole concern: Would more hens pose increased health risks to Burlingtonians?